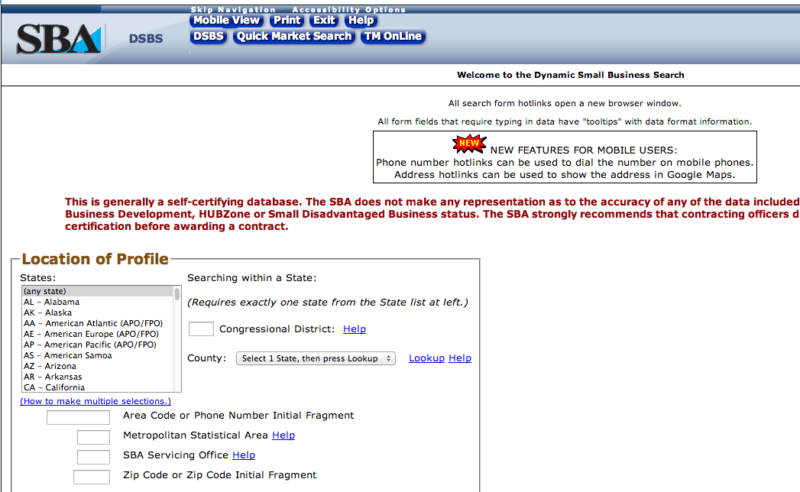 The Dynamic Small Business Search is a website that is primarily used by procurement officers to track down and locate qualified government contractors that meet federal small business acquisition needs. Thanks to the Small Business Act of 2008 every procurement officer in the United States must spend 23% of their contracting funding on businesses that are considered small, economically/socially disadvantaged, or meet specific qualifications for a federal set-aside such as HUBZone, 8a, WOSB, etc. IMPORTANT: Businesses must create their DSBS profile in System for Award Management (SAM). Businesses can not go to the Dynamic Small Business Search website and expect to make a business profile, because that is not how the system works. Once a businesses has completed their SAM registration and been sent the confirmation email their business will then be active in DSBS if they are active for an small business qualifications and/or federal set-asides.